This week Traveller Primary Health Care worker Winnie Mc Donagh facilitated her first Baby Massage 5 week programme with two Traveller mothers and babies. Baby Massage can aid emotional stress, improve sleep patterns, sooth the baby, build immunity, assist recovery from post-natal depression and promote bonding between the parent/guardian and baby. 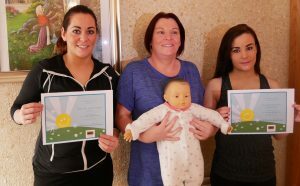 Winnie completed her training this year and is accredited through Baby Massage Ireland. Mams, Brigid and Pauline are pictured with their babies, Mary and Dakota.